Alyce Rothlein Simon (1925–2011) made radical artworks with the use of a particle accelerator, a machine historically referred to as “an atom smasher,” that exalt the power of nature. A New York City artist, Simon was already experimenting with paint on Plexiglas, a brand of acrylic plastic, when she happened to meet Dr. Kennard Morganstern, physicist and president of Radiation Dynamics. 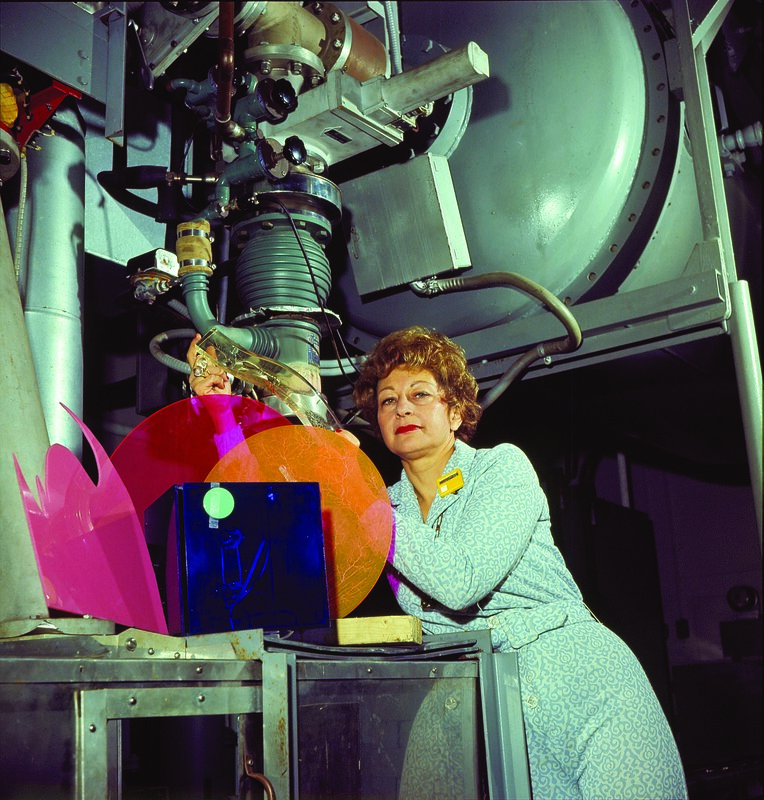 Morganstern made her aware that his company’s particle accelerator was capable of producing interesting fracture patterns on plastic due to the alteration of the material’s molecular structure when exposed to nuclear radiation. This process is called irradiation. Morganstern invited Simon to visit his radiation laboratory and consider using his high-voltage machine to make art. Simon accepted and began experimenting in 1962. Her first and second series of work consisted of sheets of acrylic that she irradiated, stained and assembled into frames or light boxes. Glowing with color, these Spatial Paintings encapsulate the awe of the celestial. Continuing to experiment, Simon gradually learned how to pre-determine the effects of the radiation, culminating with a sculpture series titled Tree of Life which occupied her from 1970 until 1986. Varying widely from wearable pieces to sculptures on spinning turntables, each clear, acrylic object contains an embedded tree-shaped fracture. The Tree of Life series with its iconic image alludes to the infinite and the eternal while demonstrating Simon’s mastery over both medium and machine. Her pioneering work ended when Radiation Dynamics sold their particle accelerator and it became too difficult for her to access another facility. Yet Simon continued to make art until her health no longer made it possible.